Four years ago, I wrote a blog about sending my firstborn off to public school. It is by far the most-read blog I’ve ever published. This tells me there are a lot of Christian mommas out there who go through what I went through. I was nervous and fearful, and I wished I could afford Christian school, until God showed me something remarkable in Jochebed, the mother of Moses. She spent three months hiding her baby to save him from being murdered, and when he was too big to continue to hide, she placed him in a basket and sent him floating down a river. You’d think that during that time she would have been nervous, fearful, and wishing her boy would have been a girl, but she wasn’t. Jochebed was not full of fear and regret, wishing that things could have been different. No, she was full of faith! 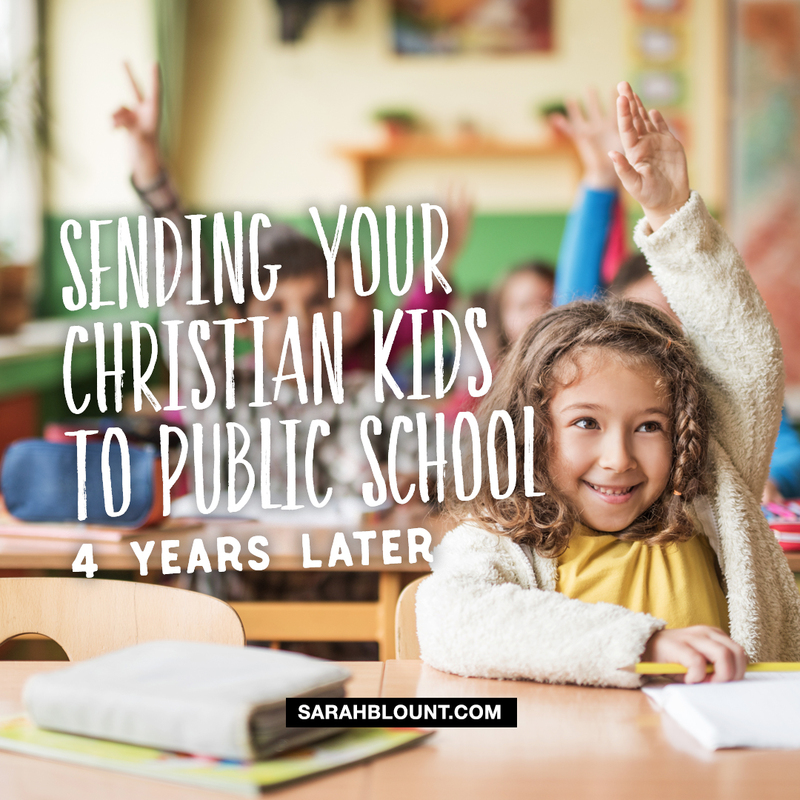 As a Christian mom sending my child to public school, I felt a little like I was putting him in a basket in the Nile River. I had to choose: fear or faith? Jochebed inspired me to choose faith. When I dropped my son off for his first day of kindergarten four years ago, I didn’t shed a tear. I believed that like Psalm 127 says, he was an arrow–an arrow we had spent five years sharpening, an arrow that would go out and fulfill His purpose. Next week, that kindergartener I dropped off in faith will start third grade, and his little sister will start first grade, and I’ve found myself thinking about Moses and Jochebed again, and how thankful I am that my kids are in the public school system. Most people would agree that the purpose of sending our children to school is so they can receive an education. We want them to learn how to read, write, and do arithmetic. Bonus points if they learn how to successfully climb a rope, make some friends, and win a class party for collecting the most box tops. But what if our kids have a higher purpose? What if school is more than test scores and learning how to multiply fractions? Back to Jochebed. She is ultimate #momgoals. She not only had amazing trust and faith in God, but she saw purpose in her kids, from the moment she laid eyes on them. Hebrews 2:2 The woman became pregnant and gave birth to a son. She saw that he was a special baby and kept him hidden for three months. Jochebed saw that Moses was a special baby. Other translations say she saw that he was a beautiful baby, but it’s referring to more than the fact that he was a pretty newborn. When she looked at Moses she saw God’s favor on him and knew that she had to save his life because God wanted to use him mightily. When you look at your kids, what do you see? Do you see purpose in them? Do you realize that the favor of God rests on them and that God wants to use them in mighty ways, just as He did Moses? Your kids are here for a reason, just like you are here for a reason, and if they attend a public school, they have an amazing opportunity in front of them to start walking in their purpose. God gave me three words to charge my kids with for the upcoming year. Three words to help fill them with purpose. Three words to send them out on mission each and every day as they hop out of my car and into the halls of their school. Matthew 5:13 Let me tell you why you are here. You’re here to be salt-seasoning that brings out the God-flavors of this earth. Our kids need to know why they are here, and as parents, it’s our job to tell them. They are here to be salt! Salt brings out flavor in food, and it also helps preserve it. Our kids should start every day thinking about how they have the ability, through their words and actions, to give people a taste of the goodness of God. They get to be like the sample servers at Sam’s Club giving out little treats of love, joy, peace, patience, kindness, goodness, faithfulness, gentleness, and self-control. And as their friends, teachers, and even their enemies get a taste, they fulfill their purpose and people will be drawn to Jesus. Our kids need to realize if they stay salty they help prevent God’s standards from rotting away. If every Christian parent kept their kids out of public school there would be no students on a mission to preserve the truth. It’s important for our children to recognize that without Christ followers like them, standing for what’s right and living according to the Word of God, God’s presence in their schools will decay. Matthew 5:14 Here’s another way to put it: You’re here to be light, bringing out the God-colors in the world. God is not a secret to be kept. We’re going public with this, as public as a city on a hill. If I make you light-bearers, you don’t think I’m going to hide you under a bucket, do you? I’m putting you on a light stand. Now that I’ve put you there on a hilltop, on a light stand—shine! The public school system needs light. It needs more kids who love Jesus and are 100 percent cool with going public with that information. People are living in darkness. Families are a mess. Suicide is the number one injury death in America. There’s so much confusion about gender identity. And on and on. People are looking for answers, and if we stay hidden away in our homes and in our Christian circles, they are going to have a hard time finding those answers. My son has seen two of his friends from school give their lives to Christ this year, and one of those friend’s entire family give their lives to Christ, because he’s decided to be like a city on a hill when it comes to his love for Jesus. God’s made our kids to be light, we have to let them shine! I Corinthians 13:1 If I could speak all the languages of earth and of angels, but didn’t love others, I would only be a noisy gong or a clanging cymbal. The only chance our kids have at being the salt of the earth and the light of the world is if they love others. In other words, they cannot fulfill their purpose without love. Sometimes we confuse being salt and light with being snarky and judgmental. I went to public school, and I remember the Christian kids who looked down on everyone. It was obvious they thought they were better and more holy than everyone else. They never made an impact on anyone because it’s God’s kindness that leads men to repentance. Our kids must understand that their purpose is to love with a love that cares more for others than for themselves, a love that fights for the bottom, a love that isn’t jealous, a love that isn’t prideful, a love that is slow to anger, a love that believes the best, a love that doesn’t give up on people. Because Moses had a mother who was full of faith and saw purpose in her children, an entire nation got to taste the goodness of God. They were preserved from extinction and miraculously brought out of darkness. My goodness. What would our schools look like if every classroom had a handful of kids who understood their God-given purpose and were being encouraged to walk in it daily? We do so much to ensure our kids are ready to go back to school: new shoes, new backpacks and lunchboxes, fresh haircuts, killer first-day-of-school outfits, tax-free school supply shopping, and meet the teacher. That’s all well and good, but let’s be most focused on getting them ready by filling their hearts and minds with their God-given purposes. Let’s make sure they know school is more than AR tests and recess. School is where they get to live out the gospel and experience true joy and fulfillment as they do what they were put on the earth to do! Let’s let loose our little Moseses and watch God move mightily in and through them, Amen? I am here for a reason. God has a purpose for me. Wherever I go, I help people taste and see that the Lord is good. I am called to make sure God’s way of doing things doesn’t pass away. People see Jesus in me. I won’t keep God a secret. I will bring light to the darkness around me. I know I can’t lead anyone to Jesus without His love working through me. God’s love never gives up and cares more for others than for self. Love is not jealous or cocky. Love is slow to anger and doesn’t keep score when people mess up. Love doesn’t rejoice when others are hurting. Love doesn’t look back and believes the best. Today I will be Salt, Light, and Love. Wow! This is Holy Spirit-inspired!My thanks as a mom and teacher to this author. God bless you. What wonderful insights from the Lord. You know I think sometimes young parents, and I was a young parent many moons ago, feel our kindergarteners are too young to comprehend all that you just spoke about; however, if they can comprehend the temper, and all the negative things, what is to stop them from shaping their little lives into what God created them to be? With Christian parents like you who pray for their children, when they are so young,to know God’s will for their little lives, God is going to honor those prayers and bring about success in that area. With God all things are possible. Bless you for such wonderful, life-changing words of wisdom. Thank you, Pat! Yes, they are capable of so much more than we think sometimes! WONDERFUL article! It relieves my grandmother’s guilt about sending my granddaughter to a public school. I’m going to read this over with my granddaughter. She’s already a strong child, but I believe your thoughts and these verses will give her a special purpose. That’s awesome, Trisha! So glad it helped you! Haha! Allison, we have the cutest salt+light+love t-shirts coming soon and each shirt order will come with little declaration cards! Thank you so much for writing this. I’ve spent the last several days distressed about a decision to eventually send my child to public school. I needed to read this today. That is awesome, Heather! They will have it memorized in no time!